The web doesn’t stand still. New ready-made solutions are released to please the taste of the highly demanding web audience. Popular blogging and eCommerce platforms get revamped every now and again. As you could have already guessed, in this blog post we will talk about a freshly released Magento 2.0 framework and F2 premium theme from TemplateMonster’s Magento templates gallery, featuring elements of material design style. Compared to the earlier releases, Magento 2.0 has become way more powerful and feature-rich. In addition to being built with valid, semantic code, it provides web users with a host of additional benefits. Let’s enumerate the most impressive of them below. • Magento 2 features full page cashing. This means that all pages of your site are built in a static file system. Thus, the average page load times reduces from 5-10 seconds to some mere 1-2 seconds. As a results, you get lower bounce rates. • An app-based file structure supports everything except config.xml. This allows you to access all templates, layouts, css and js files. • Checkout get more streamlined. In addition to a guest checkout option, the existing customers can log out without having to remember their passwords. • There is no need to select a credit card manually. Now, the system automatically detects a payment method based on the digits that one enters. • Magento 2 includes Visual Design Editor, which lets you tweak its elements without any coding involved. • If you own a large eCommerce site, then a multi-shopping feature will be of great use to you. That’s far not all of the features of the revamped platform. According to the developer page, Magento 2 includes Apache 2.2, Magento performance toolkit, Magento UI Library, PHP 5.5.x, Magento performance toolkit, CSS Pre-processor, MySQL5.6, PSR Compliance, and so much more. F2 Magento theme is built in material style. Realistic lighting, material icons, grids, deliberate color choices, large-scale typography, edge-to-edge visuals, and smart use of whitespace create a bold interface that gets the users immersed into storytelling. The theme is responsive and fully editable. It is enhanced with unique category and product pages, proving for a more impressive presentation of your store’s offerings. 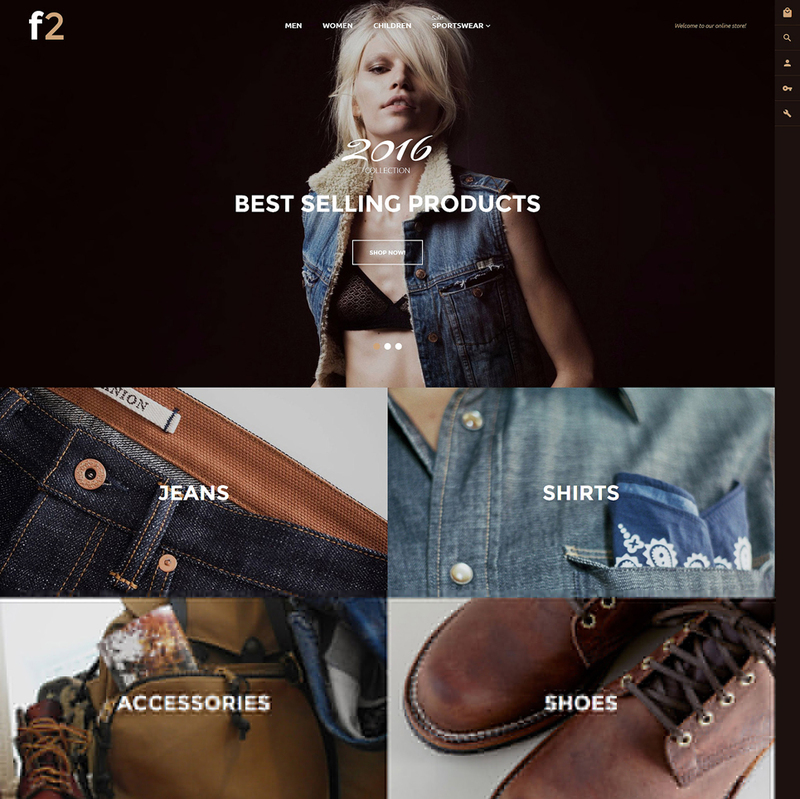 Primarily, F2 is intended for fashion and beauty related eCommerce sites. However, thanks to a variety of customization options and an advanced dashboard, you can tweak the theme to fit any other niche. F2 Magento theme includes a number of custom pages that are ready to go out of the box. In addition to a functional front page that is focused on the impressive presentation of your store’s featured products, the theme’s pack includes pre-designed category pages as well. 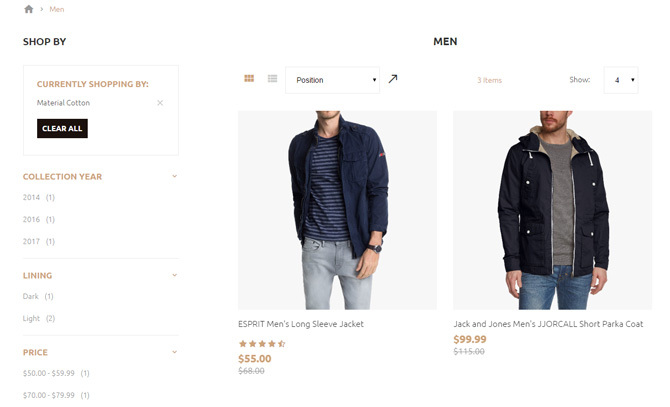 When browsing a catalog, the users can choose from grid or list based product listing, decide on the number of items that they want to be displayed on one page, shop by filters, and more. Also, the theme is pre-loaded with several handy popup forms, which can be accessed via a sticky sidebar. Thus, whenever you want to log in, use advanced live search, check out a shopping cart or real the latest blog updates, just click the respective icon in the right sidebar, and a popup will appear. One of the greatest benefits of the F2 Magento theme is integration of multiple custom modules and extensions from TemplateMonster. Let’s take a closer look at each of them below. 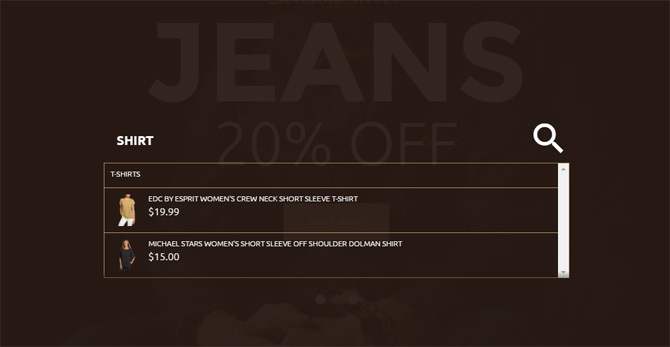 TM Newsletter Popup is the first thing that people will see entering your web store. 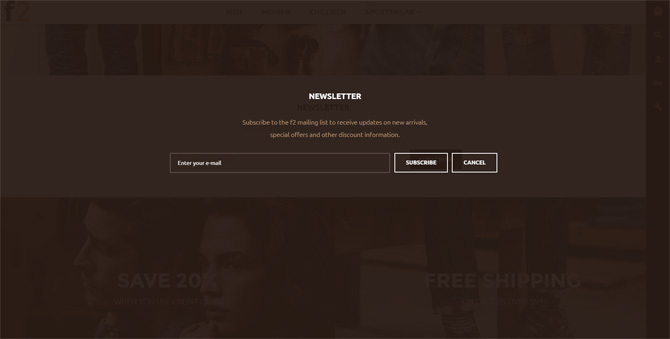 Featuring a simple newsletter subscription form, this element is fully customizable and can be tweaked to match your brand identity perfectly. The theme is pre-loaded with a fully editable TM MegaMenu, which remains fixed to the top of the page as a user navigates your content. Featuring a drag-and-drop editor, the menu can be easily customized in a variety of ways, without any coding curve being involved. If you promote multiple types of fashion items on your website, then you will need to make the search of the necessary elements as simple and intuitive as possible. TM Ajax Search is integrated to enhance the users’ browsing experience. With its help you can specify the search information and direct people to the right store pages as they enter a keyword letter-by-letter. As an administrator of your web store, you can also set the search suggests by different product attributes like price, SKU, manufacturer, shape, status, etc. The header of the theme’s front page is enhanced with TM Film Slider. With the help of this module you can showcase different products and services that are worthy of the users’ special attention. Just like all the rest of the theme elements, the functionality is fully editable. Feel free to make the slider more informative by means of images overlaid with texts. 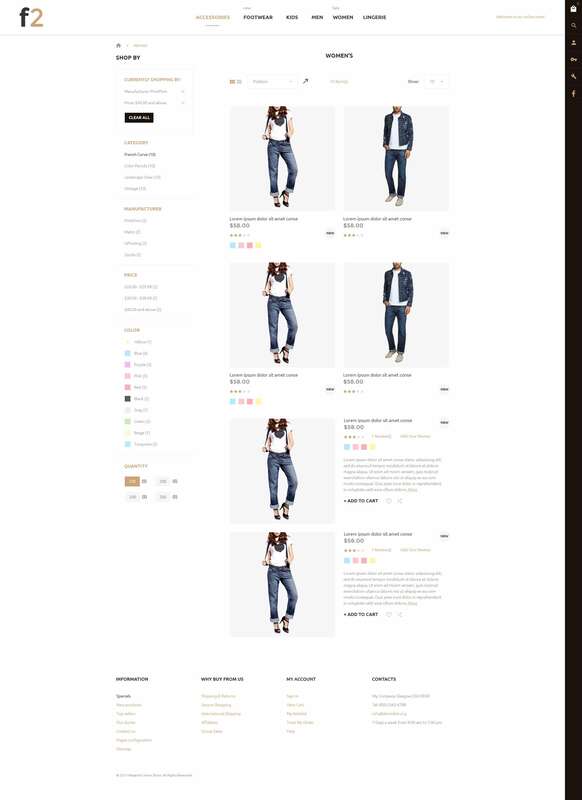 In addition to the impressive visual presentation, the F2 Magento theme includes multiple features that are intended to enhance the users’ shopping experience. Thus, the pack includes TM Ajax Catalog Filter. With its help, online shoppers can find products that match specific attributes (like category, type, price, size, color, etc.) without the need to reload the page. 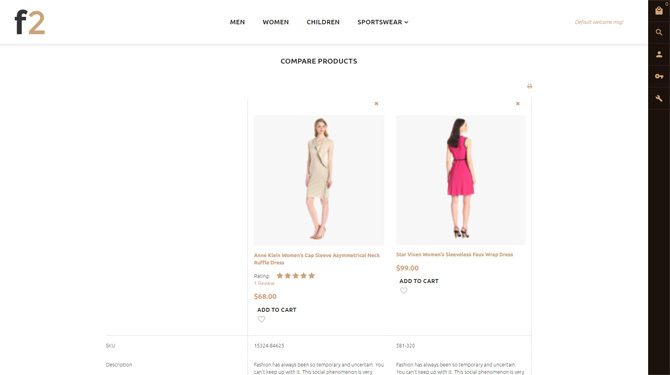 TM Ajax Compare is integrated to let your online shoppers compare several items from the inventory according to their specifications, look, description or other characteristics. TM Ajax Wishlist is added to all items of the store, on both category ad product pages. The module allows all logged-in users add a specific item to the wishlist, without the page reload. These are the key features making the F2 Magento theme an eye-catcher. Its impressive design spiced up with pro TM functionality makes the theme a time-saver for every fashion or beauty store that aims to build a remarkable yet powerful web presence. If you got interested in this theme, then you might want to take a closer look as its technical details. Live demo is also provided. Feel free to try how it performs on different screen sizes and different web browsers on your own.